I followed with great interest a traveling exhibit entitled Utopia: Revisiting a German State that was shown at the Missouri History Museum from late November 2014 until April 2015. The exhibit celebrated the 180th anniversary of the 1834 arrival of about 500 Germans, members of the Giessener Emigration Society, in St. Louis. They had traveled to Missouri to try to establish a German state there. The origin of the exhibit could be traced to an East German student, Henry Schneider, who about three decades earlier had run across the story of the Giessener Emigration Society while doing research on a script for a screen writing class. His efforts to write a script based on the Society’s experiences faltered, but a couple of decades later, in 2004, he mentioned the Giessener group to Peter Roloff, a Berlin film maker, who also became fascinated with its little-known story. To learn more about the topic, Roloff assembled a group of friends in the summer of 2005 to discuss the Giessener Emigration Society and their research about it. The amorphous group, which called itself the Traveling Summer Republic (TSR), held annual summer meetings on the subject for several years. It invited some historians in Missouri who were knowledgeable about the Giessener Society to join the meetings. In 2009 and 2011, the group met in Missouri. The 20 or so members of the TSR -- historians, writers, film makers, photographers and artists -- curated the Utopia exhibit, which was managed and financed in part by the city of Giessen. They also wrote an outstanding and definitive book, Utopia/Aufbruch in die Utopie, in both German and English, to accompany the exhibit, plus Roloff, the convener of the TSR, made two films about the topic. For Arkansans interested in the history of German immigration, the Utopia exhibit had bittersweet elements that inspired some envy of Missouri’s success in attracting the Giessener Emigration Society. The thing is, the Giessener group had been planning to settle not in Missouri, but in the Arkansas Territory. However, as the emigrants gathered in March 1834 to travel from Bremen to Little Rock, they learned that an affiliated group, the Mainzner Emigration Society, had a miserable experience in Arkansas after it had journeyed there a year earlier. Also they were told by a scout who had just returned from Arkansas that it was an unsuitable site for the planned German state. The bad experiences of the Mainzner group and the scout were caused to some extent by bad weather and water-related illnesses. The settlers, who arrived in Little Rock in May 1833, and the Giessner Society scout, who visited the city in the late fall, encountered a severe cholera epidemic afflicting travelers on the Mississippi and Arkansas Rivers. Also they observed devastating flooding along rivers and streams in Arkansas. Beyond that, they learned the hard way that malaria was widespread in the territory and discomfort from summer heat was much greater than expected. But what if Arkansas’ weather had been better in 1833? I often wondered, as many years ago I researched the George family, who came to Little Rock as part of the Mainzner group, what would have happened if Arkansas had had less flooding, cholera, and malaria in 1833. Would the Mainzner group have had at least modest success? In the absence of negative reports about the Arkansas Territory, would the Giessener group have traveled, as planned, to Little Rock and settled in the Arkansas Territory? Then, would other Germans have followed the Mainzner and Giessener groups to the Territory? If all of this had happened as planned, would Arkansas have become the German state desired by the emigrants? Perhaps examining the experiences of the two emigration societies can help answer the question of whether Arkansas had a chance of becoming the German state envisioned by the Mainzner and Giessener Emigration Societies. The idea of leaving the numerous duchies, grand-duchies, princedoms, principalities, and other sovereign entities that comprised Germany in the 1820s and 1830s appealed to many educated Germans who hoped to escape political repression and an ailing economy. Interest in emigration was especially high in the Hessen area of Germany, including its two largest cities Frankfurt and Wiesbaden, and in neighboring Rheinhessen, where the cities of Mainz and Worms are located. To be clear: the plan’s intention was for German settlers to “remain apart from the settled English and French American population….They did not want to become American.” Instead they wanted to “extensively cultivate German virtues, German customs, and the German language, raising their youth in conformity with this.” The goal was to replant their homeland, minus the political repression, in the United States. According to Münch, the pamphlet “was excellently received and encouraged us to become bold; thousands wanted to join us, and to help with the plans necessary for realization.” The planned site for the new state was, tentatively, Arkansas, which was still a territory and in 1830 had just over 30,000 residents. The idea was that similar societies and clubs would be set up “everywhere in Germany” and that these groups would remain in contact and support each other until “finally the chosen land (namely the so-called Territory of Arkansas…whither already early this year a large group has started) would be populated thoroughly with Germans.” The emigration would take place in waves until in about 25 years, 60,000 Germans would have settled an area. At that point, they could petition Congress to become a state. Apparently, this optimistic description of Arkansas was based on travel accounts published during the first decade of the 1800s that were plagiarized, enhanced, and embellished in a chain of publications, including an 1832 emigration handbook written by H.W.E. Eggerling. That handbook was an important source of Follenius’ understanding of Arkansas’ climate and geography. The society’s original plan was to found a settlement near Little Rock, Arkansas; a large complex of land was to be purchased, then of each member would receive 50 acres; the first houses were to be built communally and as close to one another as possible, just as livestock food stuff was to be provided from the collective account. The “call and declaration” prescribed that each home site of the Society’s colony should have at least 20 undivided acres. Beyond that, “Primary care should be taken that, even though agriculture will be the chief occupation, the layout should accommodate the conditions of a future town of crafts and trade.” In operating the colony, a “common treasury” would be maintained to cover “unavoidable common expenses.” Among those expenses would be the school teacher, the physician, and a clerk. It took only a few months in 1833 for the Giessener Emigration Society sign up 500 members, hold an organizational meeting, and begin preparing for the first wave of settlers to travel to the United States in the following year. In the meanwhile, a group affiliated group with the Giessener Society had departed for America in 1833. This group, the Mainzner Emigration Society, had assembled 160 to 400 people for the trip to the United States. According to Münch, “As they left Germany in March 1833, the leaders of the Mainzner Emigration Society saw themselves as the vanguard of the new movement.” They expected the Giessener settlers to join them in Arkansas during the following year. On April 30,, 1833, the members of the Mainzner Emigration Society arrived in New Orleans on the Olbers, a 152-foot long sailing ship that had departed from Bremen on March 5th. Their 55-day trip took them to the West Indies and past Jamaica on their way to their final destination. The same ship would take the first group of Giessener Society settlers to New Orleans the following year. Only 140 of the Society members went to Arkansas because the others chose to go elsewhere. They could do so because the Emigration Society had dissolved itself due to bickering and disagreements even before the ship reached New Orleans; the “common funds” had been redistributed to the families. This core group followed the original plan to travel to Little Rock. However, when it got there, its members could not agree on where to settle. Some wanted to buy land along the Arkansas River; others, who feared the River land would frequently flood, wanted less risky acreage. Ultimately, the 140 families ended up going to different five different locations, including one group to White County. The largest group, which included Gustav Klingelhöffer, a Lutheran pastor who was a leader of the Society, settled a colony near the North bank of the Arkansas River. That group regretted its decision in 1835-1836 when their lands were inundated and lives threatened by flooding. Perhaps Bromme was showing some schadenfreude in his description, and things were not quite so bad. Nevertheless, we do know that within a few years of their arrival, many, if not most, of the 140 emigrants who arrived in Little Rock in 1833 had left the state or died. However, several stayed and some, such as the George Family in Little Rock became prominent local citizens. Why, aside from the abysmal weather and health problems in 1833, did the Mainzner Society’s settlers fail? Writing in the 1860s, Münch suggested that Klingelhöffer and his group were so taken by the glowing reports about Arkansas that they left for America without really thinking through their plan. He wrote, “They left before plans were really complete, before they had the advantage of receiving feedback from a commission to be sent by the Giessener Society.” He agreed with Traugott Bromme’s assessment blaming the difficulties encountered by the Mainzner group on haste and poor planning. As will be discussed later, other, larger factors also impeded the success of the Society. The story of Arkansas’ unsuccessful German settlement faded from history over time. However interest in the group started to revive as post World War II researchers became interested in Gerstäcker’s rich accounts of his travels in Arkansas during much of 1838 to 1842. Although Gerstäcker did not tell the story of the Mainzner settlement, he described in his book Wild Sports in the Far West his encounters with several Germans who had come to Arkansas in 1833 as part of the group. He became especially good friends with Klingelhöffer, who Gerstäcker stayed with on his farm in Perry County. The efforts to document the story of the Mainzner Emigration Society got a great boost in the 1970s when a descendant of German emigrants became interested in it, and as an amateur historian and genealogist, undertook a remarkable investigation of the topic. We know as much as we do about the 1833 Mainzner Emigration Society largely because of the work of Ruth Yingling Rector, whose ancestor Sebastian Jüngling had emigrated in the 1840s to White County, Arkansas, along the Little Red River, where his sister, a part of the 1833 group, had located with her husband and children. Rector’s research, which began in 1975, took her to archives in Germany several times. She, with a collaborator in Germany, managed to identify about 110 of the 140 settlers who were part of the 1833 group. Also, she located letters that the wife of Klingelhöffer mailed to her parents, starting just before the Olbers departed for New Orleans. Although illness stopped Rector from writing a planned book on the topic, her decade of work left a rich trove of documents, research papers, and other materials that are now in the Butler Center for Arkansas Studies in Little Rock. A few years after Rector’s death, her work was taken up by Shirley Schuette, who wrote about the 1833 emigration in her master’s thesis (which should be a book) and in other papers, including a recent publication in the Arkansas Historical Quarterly. Using Rector’s materials and her own research, Schuette has written the most complete account of the 1833 Mainzner Emigration Society. Even though the arrival of the Mainzner Emigration Society settlers in Arkansas in 1833 has not been celebrated in Arkansas as the Giessener group is being celebrated in Missouri, its story recently has been told more fully than ever. Likely other related documents await discovery in some musty archives in Germany, and in future years will we know even more about the group and this small element of Arkansas’ history. The 500 people selected to be members of the Giessener Emigration Society were a balance of different types of craftsmen, agriculturalists, and people working in professions. The Society leaders did not welcome poor, lower class applicants such as farm hands, day laborers, journeymen, and others without skills or education. These types of people were deterred from participating by the high cost: those selected had to pay upfront for transatlantic transportation, a passport, money to be used to buy land, and other common costs. After the goal of 500 participants was reached, Society members began the often difficult and usually painful process of preparing to depart from their jobs, homes, and homeland. They divided into two groups; one was made up of emigrants who could depart earlier than the others. Two ships sailed from Bremenhaven in 1834 to take members of the Giessener Emigration Society to the United States. The first ship, the Olbers, took about 240 Society members to New Orleans under the leadership of Paul Follenius. It departed on March 31, arriving on June 2nd, a troubled 63-day trip. One of the scouts, a trusted and good friend of Münch, wrote him privately, “For heaven’s sake, do not leave your position! America may be a good land for a sturdy worker, but not for an educated German.”  But it was too late. Münch had left his job and was in the middle of preparations to depart. At the beginning of the voyage, several passengers on the Olbers came down with smallpox and deaths followed, including a young child of Follenius. In addition to the problems caused by sickness, the conditions on the ship stirred discontent among the society members, in part because while most people were in steerage, some wealthier members of the Society had booked themselves into cabins. After getting to New Orleans, the group headed by steamboat to St. Louis. Unfortunately, the cholera epidemic that that afflicted the 1833 Mainzner group was still around, hitting the Giessener group very hard, with 40 dying. In the middle of the trip, Follenius became very ill and had to leave the boat to recover. By that time, the group had had enough: they decided to dissolve the society and distribute the common funds; when the steamboat got to St. Louis, the emigrants scattered. In the meanwhile, departure date of the second ship was unexpectedly delayed from early May to June 3rd. Although 260 society members had traveled to the Bremen area in late April for the voyage, the ship that was to take them, the Eberhard, sank on its return trip from America. The month-long wait was painful and expensive. When a replacement ship, the Medora, was finally procured, only 197 of the original 260 emigrants were on the ship as it departed on June 3. The voyage lasted just over seven weeks, arriving in Baltimore at the end of July. While the passengers liked the two-year-old ship, they disliked the captain, complaining he fed them with spoiled meat and gave them rank water to drink. After arriving in Baltimore in late July, the society members were on their own to meet up in Wheeling, Ohio to travel together down the Mississippi to St. Louis. After the Society dissolved, several of its members – including Münch and Folleius -- moved to an area near St. Charles, Missouri. Although the settlers lived near each other, they were not part of a communal settlement. Münch become a successful farmer, writer, and politician. Also, he was among the leaders that helped insure Missouri did not become part of the confederacy. In the ante-bellum years that followed the failure to establish the “utopia,” Arkansas and Missouri had vastly different patterns of settlement. Between 1833 and 1850, few German immigrants settled in Arkansas. The 1850 census showed that only 599 Arkansans had been born in Germany. On the other hand, Missouri had a healthy influx of German immigrants: in 1850, 45,049 (7.4%) of Missouri’s 605,424 residents had been born in Germany. It was the second highest percentage among all states. Although the Giessener Society members did not get their “utopia” -- the German state they wanted – those who stayed in Missouri did get a state in which Germans played an important role in its economy and politics. The influence of the Germans in Missouri was most apparent when the Civil War came. The German population was influential in both keeping Missouri in the Union and in populating the military units that fought battles against Arkansas’ confederate forces. Ultimately, they played a big role in helping the Union Army gain military control of most of Arkansas. Did Arkansas’ Weather in 1833 Change the Course of U.S. History? Back to the question of whether Arkansas had a chance of becoming the German state envisioned by the Mainzner and Giessener Emigration Societies if the weather had been better. The answer seems to be “no.” The experiences of the two Emigration Societies suggest that weather was a minor factor in their failure. Even with the best weather and mildest health problems in 1833, the Mainzner Society’s colony in Arkansas would most likely have failed because of human nature and because of the reality of life in Arkansas. It was no accident that the Mainzner Society fell apart before its arrival in New Orleans and that the members of the first group of the Giessener Society ended their participation in it before arriving in St. Louis. Although each group was made up of educated people who disliked the political situation in their home states, most group members had not known each other before they joined the Society. They were not bound to each other by blood, friendship, or religious beliefs. Without ties stronger than dislike of the political situation in Germany, they had little basis for deep mutual trust or shared sacrifice. The problems of a lack of mutual trust and an unwillingness for shared sacrifice were compounded by the absence of strong leadership. As voluntary associations with democratic decision making rules, Society leaders could not make decisions to force people to do anything they did not want to do (outside of actions required by the written Society rules). Thus, to be effective, the leaders needed to be highly persuasive, preferably charismatic. Apparently, the leaders of both Societies leaders were neither. Without effective leadership and trust, the two Emigration Societies faltered as they faced the inevitable hardships and the need to overcome difficult hurdles to achieve their goals. Neither was able to overcome even the initial stresses of a long and miserable journey. As the discomforts and illnesses increased, the Society’s bonds were not strong enough to hold the group together. If it had been possible to build a large colony in the Arkansas Territory, the Mainzner Emigration Society likely could not have done it with the type of settlers it brought to Arkansas. It lacked the laborers and famers who could have supplied the needed back-breaking work to tame a wilderness. Like the Giessener group, “many participants [of the Mainzner group] were simply not capable of the difficult manual labor involved.” The advice Munch’s friend had given him also applied to the Mainzner group: Arkansas was no place for educated Germans. The damnest place I ever saw. It seems doubtful that educated Germans would desire to live in such surroundings even if they had been successful in developing their colony. Clearly, the Arkansas Territory could never be mistaken for a potential Utopia. The realization that Arkansas most likely was not robbed of a German state by bad weather made it easier for Arkansans to enjoy the celebration of the Giessener Immigration Society’s arrival in Missouri and, through the exhibition, to learn more about its own 1833 German settlement. The members of the Traveling Summer Republic did an outstanding job researching this part of Germany’s and Missouri’s history, impressively unearthing facts about what happened and why, plus vividly telling the story of the Society. Their work as presented in the exhibit, the book, and the films should enrich the knowledge of everyone interested in the history German immigration in the United States. For more information about the exhibit, see this web sites: http://www.aufbruch-in-die-utopie.net/en/exhibition.html . For more information on the topic, go to http://mo-germans.com/ . See Henry Schneider. 2014. 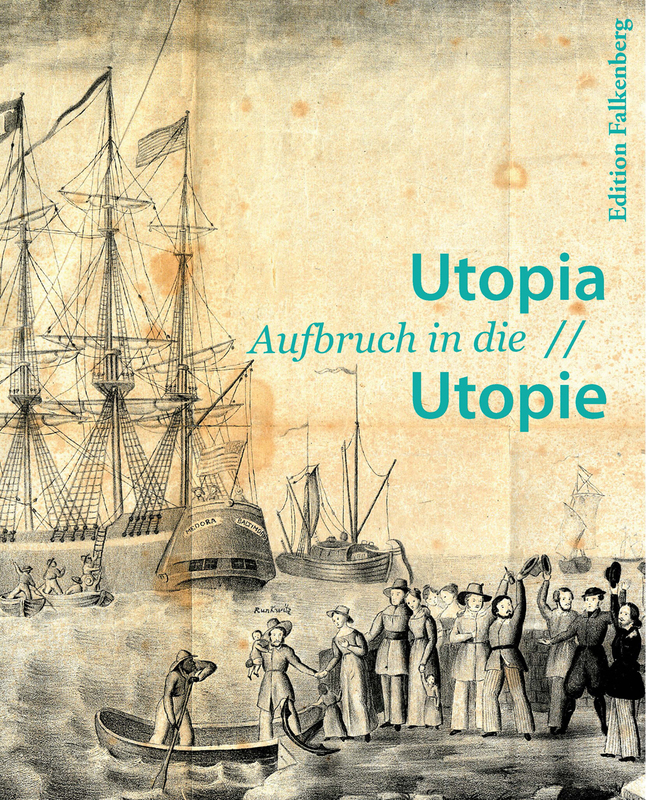 The America Weary, Utopia/Aufbruch in die Utopie, Edition Falkenberg. pp. 289-292. Recently, the story of the Mainzner Emigration Society was told in an article in an issue of the Arkansas Historical Quarterly that was devoted to article about Friedrich Gerstäcke: Shirley Schuette. 2014. Friedrich Gerstäcker’s Friends in Arkansas. Arkansas Historical Quarterly, LXXIII (1), pp. 102 – 114. A good discussions of the reasons for emigration from Germany in first part of the 1830s can be found here: http://mo-germans.com/2012/09/09/bold-moves-to-america-german-pioneers-in-the-midwest-of-the-1830s/ Maps of the small states in Hessen are in Utopia/Aufbruch in die Utopie, pp. 318-319. Utopia/Aufbruch in die Utopie, p. 98. Münch quoted in Utopia/Aufbruch in die Utopie, p. 93. Utopia/Aufbruch in die Utopie, p. 72. The “call and declaration” pamphlet, after describing the benevolent environment of Arkansas, stated that “we shall not depart until we are thoroughly informed on the conditions there.” It suggested that the Society would send a commission to scout the areas to be settled, which it did. Gert Göbel. 1877. Länger als ein Menschenleben in Missouri. Verlag Wiebusch und Sohn, St. Louis, quoted in Utopia/Aufbruch in die Utopie, p. 94. For a biographical sketch of Göbel, see Walter D Kamphoefner and Adolf E. Schroeder, Gert Goebel and the Giessen Emigration Society, in Utopia/Aufbruch in die Utopie, pp. 267- 283. The first page of the newspaper is reproduced in Utopia/Aufbruch in die Utopie, p. 106 and quoted on page 98. The actual number of members of the Mainzner Emigration Societies who traveled to the United States is not known. The New Orleans landing records for the date of their arrival are missing. Some writers state that the 140 people who went to Little Rock were about a 1/3 of the total membership of the Society; others assert that only about 20 did not go to Little Rock, indicating a total of about 160 people were in the group. Hiram Whittington. 1986. Hiram Whittington Letters in Authentic Voices: Arkansas Culture 1541-1860, Sarah Fountain, ed. University of Central Arkansas Press. Report of Louis Reuter concerning the emigration of his brothers-in-law [Carl and George] Sandherr to America in 1833” in Ruth Yingling Rector. n.d. A German Emigration to Arkansas, manuscript in Rector papers at the Butler Center for Arkansas Studies. Schuette, 2005 and Schuette 2014 (See notes 6 and 17). Friedrich Gerstäcker. 1844. Streif- und Jagdzüge durch die Vereinigten Staaten Nord-Amerika, volume 2 (1844), p. 29. Available as free Google e-book. Published in English in edited form as Wild Sports in the Far West. William Featherstonhaugh. 1844. Excursions through the Slave States, pp. 167-168 (Free Google e-book). Traugott Bromme. 1846. Rathgeber für Auswanderungslustige. (Free Google e-book). Dan Durning. 1975. (See note 6). See Bromme (1846) note 25; Friedrich Münch.1864. Zur Geschichte der deutschen Einwangerung. Deutsch-Amerikanische Monatsheft für Politik, Wissenschaft und Literature, vol. 1, p. 484 (Free Google e-book). Clarence Evans, a native Arkansas, did the most interesting and detailed research on Gerstäcker’s travels in Arkansas. Two examples of his early publications are: Clarence Evans. 1947. Friedrich Gerstäcker: Social Chronicler of the Arkansas Frontier. Arkansas Historical Quarterly, 6, pp. 440-449 and Clarence Evans. 1951. Gerstäcker and the Conwells of White River Valley. Arkansas Historical Quarterly, 10, pp 1-36. Evan’s papers are available at the Arkansas Studies Institute in Little Rock. Ruth Yingling Rector. A German Emigration to Arkansas. (see note 19). See a story about her papers at this link: http://www.butlercenter.org/banner/2008_spring.pdf. Hella Hübsch and Ruth Rector. 1982. Auswanderer nach Arkansas (USA) 1833. Auf der suche nach Namen and Herkunftsorten einer deutschen Reisengesellschaft.” Hessische Familienkund, June, 117-122 (a copy of this article is in the Rector papers at the Butler Center for Arkansas Studies). Schuette, 2005 and Schuette 2014. See notes 6 and 17. Utopia/Aufbruch in die Utopie, p. 93. Briefe von Deutschland aus Nordamerica. 1836. Quoted in Utopia/Aufbruch in die Utopie, p. 94. Münch 1864, p. 487 (see note 27). Letters from Germans out of North America, 1836. Quoted in Utopia/Aufbruch in die Utopie, p. 140. For the story of Münch and other Germans in Missouri after 1834, see Dorris Keevan-Franke “Missouri – “Where the Sun Shines,” Utopia/Aufbruch in die Utopie, pp. 173-260. Utopia/Aufbruch in die Utopie, p. 147. Utopia/Aufbruch in die Utopie, p. 146. Bromme. 1846. (See note 25). Göbel 1877, p. 147 (See note 14). Utopia/Aufbruch in die Utopie, p. 84. S. Charles Bolton. 1993. Territorial Ambition: Land and Society in Arkansas 1800-1840. The University of Arkansas Press, p. 2. Friedrich Gerstäcker. 1844. Streif- und Jagdzüge durch die Vereinigten Staaten Nord-Amerika, volume 1, p. 139. Available as free Google e-book.